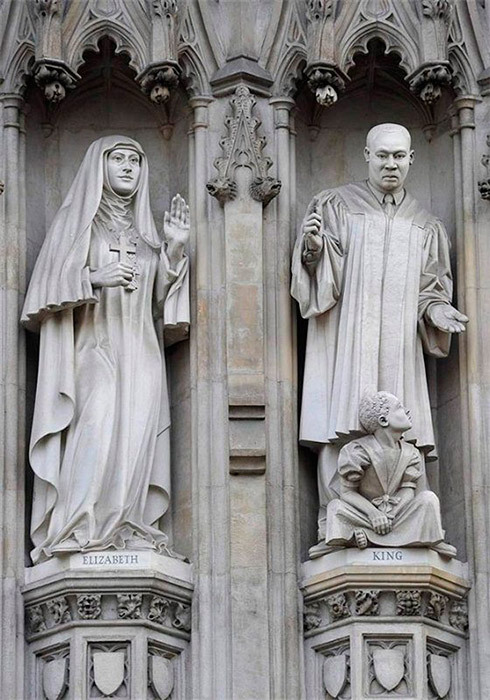 Ten 20th-century Christian martyrs from across the world are depicted in statues on the facade of Westminster Abbey, above the Great West Door, in London; the fourth from the left is Grand Duchess St. Elizabeth of Russia. / Grand Duchess Elizabeth Feodorovna. Sculpture. Westminster Abbey, London. Elizabeth (Elizabeth of Hesse-Darmstadt and by Rhine) was born a German princess and, after marriage, Elizabeth Feodorovna, Grand Duchess of the House of Romanovs. Throughout her life, she helped the suffering. After her martyrdom during the Russian revolution, Elizabeth was canonized as a saint. Today, a sculpture of her is located among the martyrs of the 20th century on the façade of Westminster Abbey in London.